I finished college in the early '90s. I lived in Port Orange, Florida, a neighboring town to Daytona Beach. I was a securities principal, stock and bond trader and a broker. At the time, I had a beautiful office in the Halifax Harbor Marina on North Beach St and Basin — right on the Halifax River. I could take my boat to work if I didn't feel like driving my Corvette (sorry, I was young and inexperienced). I have wonderful memories of achievements and accomplishments that my years there brought. I earned a comfortable living and enjoyed every day. This was truly the beginning of the Internet boom. Stocks like AOL, Compaq, HP, Dell and Yahoo were making people rich. They were trading on thin air and only went up. Thank goodness for my Bloomberg workstation. I realized that if stocks could be traded on the Internet like seemingly everything else, people wouldn't need my services for long. My office was next to a yacht brokerage. The owner of the brokerage and I used to look at these companies and try to think of how to capitalize on the Internet. I remember specifically talking about this new company "eBay" at the end of 1995. "Do you think people would ever buy a boat from the Internet?" the owner asked me. "There are some things you just can't buy without seeing up close, touching, feeling and trying out," I responded. He, of course, was talking about boats, while I was trying to figure out how I could break away for a couple days to go to the Toy Store in Fort Lauderdale to look at a white Ferrari 348 Berlinetta that I saw in Auto Trader. Hey, what did I know? People also used to think that the world was flat. Fast forward 20 years, and not a day goes by that I don't look at cars to buy or sell online. I have bought and sold dozens of Porsches in the last 10 years. There are only two that I didn't find online and only one that I didn't sell online. The best deals I have made — on both sides of the transaction — are when I work with educated buyers and sellers. I've pretty much got it down to a science at this point. I thought I’d share a few basic ideas that I use that might help you find your next car or find a good home for your current one. I'm only going to talk about buying, but if you're a seller, try to think about how these concepts would apply to your side of the transaction. Now, I'm not going to tell you what to look for in a car. There are plenty of articles that do that. Instead, I think it's important that you know what to look for in yourself, in a seller and in your venue. Online venues allow opportunities for buyers and sellers to air their laundry. Ask questions, get pictures, learn about the seller. First and foremost, get yourself prepared. Know what you want to buy. For example, "I want a sports car" is different than "I want a Porsche," which is different than "I want a 911," which is still not as good as "I want an '87-'89 911 Carrera with a 3.2L engine, G50 trans and a hydraulic clutch." When you have narrowed down what you want, use the resource this article is about and start your research. Join a forum. Read everything you can find about the car you're going to buy. Learn what's great about it and learn what's not. 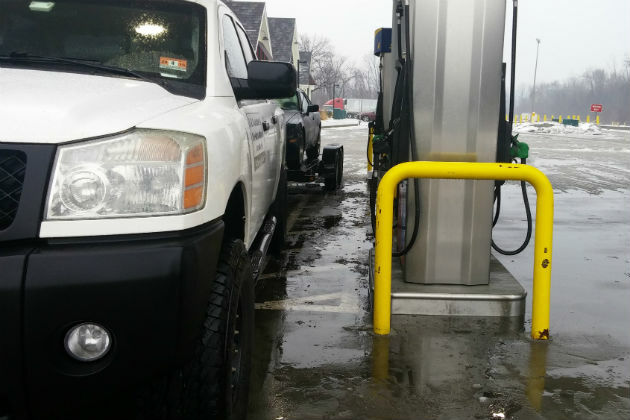 Learn the maintenance requirements and costs and how to tell if the car has been well kept. Learn about where the value is and any special options that your car should have. Be specific. Pick a color combination, a basic amount of mileage that's acceptable, and a general condition level. Then go back to your forum and talk with owners and enthusiasts about what you should expect to invest in such a car. Have an open mind. People will share their experiences, so some numbers will seem high and others artificially low. Some people will have had wonderful experiences and others not as much. If you don't feel comfortable chatting with anonymous, nameless, faceless avatars, just Google the question, "How much does a 1989 Porsche Carrera cost?" It will return you dozens of threads on more forums and websites than you even knew existed. It will also show you cars for sale, but don't get too distracted and fall in love just yet. Try to establish a price range. While you're at it, do everyone a favor — be realistic. You'll set yourself up for frustration and disappointment if you think that your dream car is going to be the cheapest one on the Web or that you'll be able to negotiate a ridiculous price on a really solid car. I'll cover this in detail when I tell you about sellers. When you know what you want and how much you should expect to spend, add "the four T's" to the total. Tax, title, tags and transportation all cost money. Depending on the car, this may be a few hundred dollars or several thousand. Will you add this to the amount of your purchase or does your budget only allow for a total, all-in amount? Figure it out. Like I said before, it's important to be realistic. At this point, you're armed with some valuable information because, with the power of the Internet, you will almost certainly be able to locate a car that matches your search criteria at a price that you can handle. Good sellers with good cars will go the extra mile (or 700) to get their cars into the hands of another enthusiast. Surprisingly, I consider the next part the most important — find the right seller. The best cars come from the best sellers. Don't be afraid of a car that's on the high side of the price range if the seller is a club member, a forum member, has a binder full of receipts and 700 photos of the car. I love it when a seller tells me his car has a name. They don't need to be a mechanic or even an expert on the car. They should, however, be able to answer you intelligently about anything you ask that your research turned up as hot buttons or sore spots. They should not hesitate providing full disclosure. If the seller doesn't seem transparent, find another car. When you are looking for a used Porsche, the best cars will come from sellers who love Porsches. If they won't budge off their price, it usually means they believe the car is worth what they're asking and that if you can't afford it, someone else will. Guess what. They're probably right. If a seller doesn't defend his price or starts dropping when you hesitate for a moment, then he is probably sharing his thoughts on what the car is really worth. Maybe he's trying to unload it in a hurry? Either way, if it doesn't seem right, it probably isn't. I'm not talking about an "attachment premium" — when a seller feels his car is worth a few bucks more than it actually is because he loves it so much. I'm talking about a car that's priced right, yet the seller starts hacking thousands off his price every time you ask about a service item or minor flaw. Good sellers defend good cars. After doing his homework and research and working with me over the course of a month, a great buyer connected with me on eBay. I worked with him to make sure he could get this car. Finally, know your venue. I consider three different arenas to be a part of the online marketplace: specialty or enthusiast forums, eBay and online "car trader" publications and, of course, Craigslist. I don't know why, but I have found that few people even consider this subject. I have found that the best sellers have the best cars and want to sell them to the best buyers. They hold their car in high esteem and like to be in places, online or otherwise, where others also see value in their prize. Boutique dealers, model-specific forums, online classifieds for collector magazines and even brokerage listings almost always have the nicest vehicles. Expect to peel off a few extra dollars to buy a nice example from a serious seller. It's worth it. eBay and comparable auction sites are my next choice. They are so big that I can almost always find a couple cars to compare and choose from. The drawback is that megasites can be a little impersonal and often present distance challenges. If shopping on eBay, I suggest you ask a ton of questions. Expect detailed answers. Expect personal answers. Is the seller able and willing to show the car, deliver the car and discuss any flaws or shortcomings? Will they provide more pictures? Do they have documentation? Will they get on the phone? Ask them if they're on a forum. Find them. Find their car. If you feel good about it, bid confidently. eBay and the other large sites offer nice protections for buyers and sellers. There are deals there, you just have to work a little harder to get them. Lastly, there's Craigslist. I compare it to a garage sale in the Wild West. Still, I buy more cars on Craigslist than from any other venue. However, I will buy a car without a title. I will buy a car because it has a specific transmission that I need for another car. I will buy a car because I need one rim. I will buy a car that hasn't run in 15 years and is home to several families of rodents. I buy cars on Craigslist because it's more convenient than trying to find forgotten lumps in farmers' fields. I have listed a couple cars on Craigslist but have never sold a single one there. I don't like to trade cars for dishwashers or pipe organs. 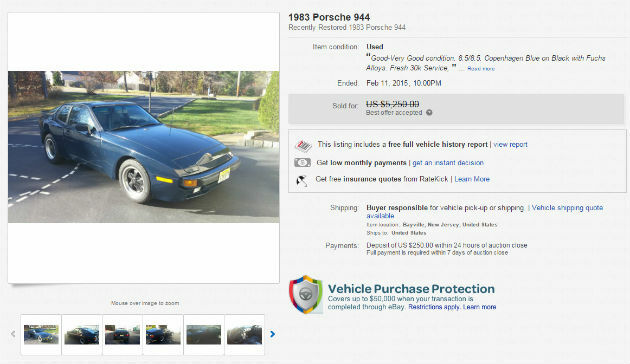 I don't want to buy a Porsche with my 1992 Jimmy and $86 in cash. 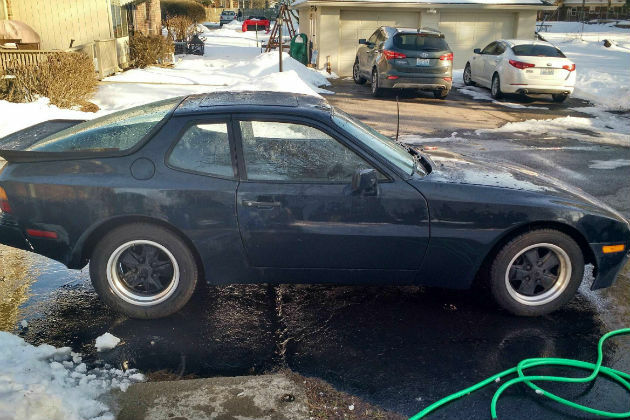 I won't take four payments of $900 for my completely refreshed 944 Turbo. I'm a serious buyer and a serious seller, and it's just not a serious venue unless you're shopping for a project. So go forth and be confident. Seek information. Be picky and specific. Know what you want and know how much it should cost. Be patient and prepared. Find someone who has what you want and knows what they have. Learn about them. Learn about the car. Arrive at an acceptable figure. Sort out the logistics. Get your car. It really is simple and, in a way, a little ironic. People tell me all the time that they hate car shopping. They feel like they're pressured. They feel like they paid too much. They hate car dealerships, and they hate salespeople. They really don't need to stress so much. 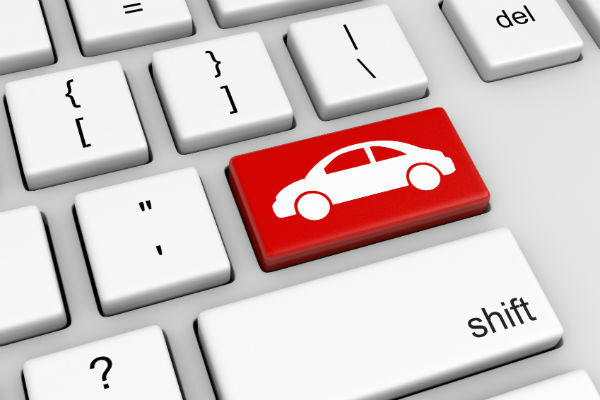 After all, the perfect dealership is just a few keystrokes away.